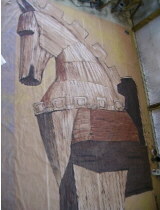 The project is a large translucent painting. The final works must be carried onto a field by several people. It is 27' high and 29 wide. 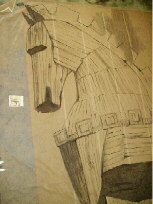 The first phase is a series of sketches and paintings passed to the customer to reach agreement on concept. The paintings are representational, but not final in composition. The colors in the paintings only suggest the final colors, the intensity of the colors is not attempted. 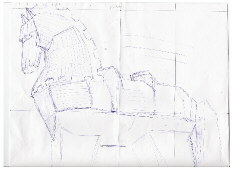 A scale sketch is drawn up. You can see some changes that include militarizing the horse a little more. 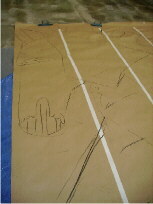 The scale drawing is cartooned on to Kraft paper. 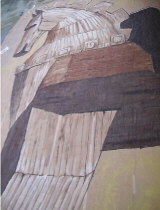 This is one half of the full painting, and stretches 27 feet. You are seeing the cartoon from at a height of 16 feet. The full painting actually exceeds the size of the building it will be painted in. 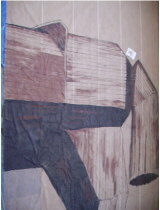 The dark colors are painted on the front half of the painting. This is the first real opportunity to get an idea of how the final piece will look. 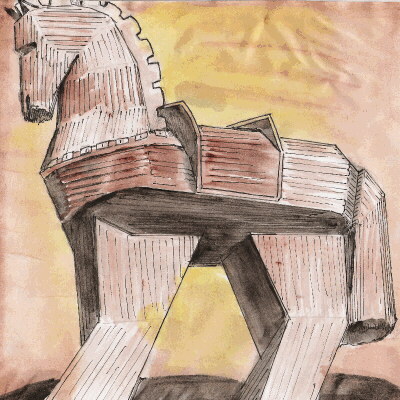 The white paper to the left of the horse is the reference painting (8" x 10"). That can give you an idea of the scale of the piece in work. 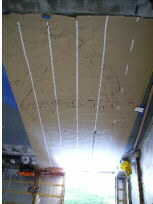 The white lines running through the painting are the masking tape on the Kraft paper behind the painting (the painting is translucent). Please note that the photo is taken at an angle to the painting (on a ladder 16' up), thus distorting it. The front half is finished. 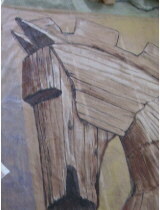 The lighter colors really add the punch to the picture, and show up the little details like knots of wood. The horse does have "feet". Please note that the photo is taken at an angle to the painting (on a ladder 16' up), thus distorting it. What the artist sees is even more of a distortion, at left is a shot of the real view from the floor. The dark colors are painted on the back half of the painting. The light colors when added will add the punch to the picture, but don't expect the back end of the horse to ever be as exciting as the front! 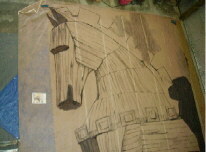 The white paper to the right of the horse is the reference painting (8" x 10"). That can give you an idea of the scale of the piece in work. Both halves of the painting have been joined. Once joined, and sewn there was a final touch up and unification to make sure lines matched, perspectives fit, and colors matched. The sewing is done with "fail safe" seams. Should a seam fail there is a second seam. Because of the possibility of this piece having to deal with breezes during contests. The customer is aware of the danger of weather risks. Any large piece will act as a sail, so windy situations need to be avoided. There are also risks the customer knows about any rain/dew exposure causing colors to run. To minimize this risk, a low dilution of paints was used (increases the binder present). You can tell that it is now nearly impossible to photograph the piece, without a distortion. 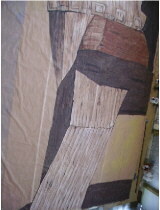 The pictures shown at left are either distorted or taken from a ladder that has been rolled in place on top of the piece.